If you've been around the 3d industry long enough I'm sure you've seen this. But I wanted to point out a great little gadget that makes navigation in your 3D files much easier. 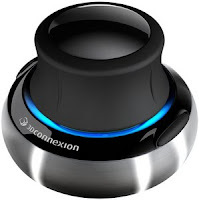 It is the SpaceNavigator by 3D connexion. I've found it primarily useful for trying to pick out good camera angles in my 3d scenes. This 3d mouse really lets you maneuver through space without having to do alot of tumbling around, and it's great for finding just that perfect camera angle. Above is an example of what it looks like to navigate through SketchUp using the SpaceNavigator, and there are numerous 3d programs that it supports. Notice how you can use the mouse while you're still navigating. I recommend trying it out, it will change your 3d experience. They are a nice gadget Ramy! Hopefully 3d connextion will update their driver soon so that I can start using it again! Does still work great in Rhino though! Hi Ramy! The 3d mouse is definitely a great gadget since it helps in managing 3d models. Architects and designers can use this to check the details of their models. Prior to the output, companies use 3d laser scanning services to measure their products. Various types of laser scanning equipments can accurately measures objects which aids other development processes like rescaling.